This is a check list with diy home improvement tips for those small repairs and unfinished projects that should be taken care of before you place your home on the real estate market. When you are ready to present your house to prospective buyers, you want it to look its best! If home buyers encounter one problem after another, they'll assume that bigger and more expensive problems exist behind the walls and in the rafters. A run-down home with stained ceilings, damaged floor tiles, or a running toilet, will scream dollar signs to buyers. They'll make a list and use it to negotiate the price of your home down! Perhaps you're willing to wait for that one person who wants to pay less for a “fixer-upper.” Wouldn’t you rather get a better price by making your home more marketable to a larger number of home buyers? You can achieve this by doing some diy home improvement fixes that buyers don't want to deal with when they move into a new home. The following information deals ONLY with smaller diy home improvement projects. If you have structural issues, a roof in need of replacement, cracks in your foundation, or ancient "knob and tube" wiring lurking inside your walls-- call the professionals. Check the ceilings and walls in every room-- look for stains, crack and holes. If you have water stains, this may indicate some larger plumbing issues. Don't paint over the stains without having it first inspected by a professional. Wallpaper and faux wood paneling... home buyers particularly hate them! These are often deal breakers in a home sale. See removing wallpaper and painting wood paneling. For small non-structural ceiling and wall cracks and small holes, try using my favorite spackling product, “DryDex.” This product goes on pink and turns white when its dry. It dries really fast! Add a second coat if needed, or go on to sanding and painting. All you need is a putty knife to smooth on spackle. Another great product is, “One Time” Red Devil light spackling putty-- it drys fast, as well. You can find both of these products at Lowes, Home Depot, and most home supply and hardware stores. To repair large holes in drywall, watch the diy home improvement instructional video below by Build.com. Popcorn textured ceilings... the only thing worse than a popcorn textured ceiling is a popcorn ceiling with sparkles in it! Popcorn-textured ceilings are detested by home buyers almost as much as wallpaper and paneling. I lived in a rented house years ago with sparkly popcorn ceilings in every room. I would often wake up in the morning with sparkles on my face that had drifted down during the night. You can remove the popcorn ceiling texture yourself. If you suspect asbestos, have the ceiling inspected by a professional first. Inspect all the windows; do they need re-caulking? Cracked or broken window panes? Do all the windows open and close? Take a look at your baseboards, they tend to get all sorts of abuse. Are they scuffed up or cracked? How about molding and door trim? Could they use a fresh coat of paint? A new coat of paint on your baseboards will give your home a clean fresh look. Match the color throughout the house for good flow. Check your closets, windows, and bathrooms for mold. For tips on cleaning or removing mold, go to getting rid of mold. Clean the soot from brick or stone with Johnson "Scrubbing Bubbles" bathroom cleaner. Yes, it's a bit unorthodox, but it works! Spray this product on the affected areas, leave on for the designated time, then scrub off using a scrub brush and water. Repeat if needed. Rinse with clean water. 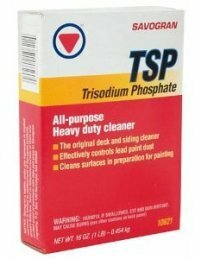 Or try TSP, trisodium phosphate, which is also a good masonry cleaner. You'll need gloves, eye protection, and plenty of elbow grease when using this product. Update an ugly brick fireplace by painting it yourself! See painting interior brick. Painting an massive ugly fireplace in a neutral color the same paint color as the walls beside it will make it seem less obtrusive. Update a dated brass fireplace surround or screen by spraying painting it black. This is an easy diy home improvement project. Make sure your work area is well ventilated. Protect the surrounding fireplace and flooring by taping off and covering with plastic. Do any doors squeak? Loose knobs or broken screen doors? Do the brass knobs need polishing? Refresh the brass by applying "Brasso" multipurpose Brass Polish. Watch the video by Buildipedia.com for instructions on cleaning brass. Dirty walls are a red flag to home buyers. They will assume the entire house is dirty. Clean the grime easily from your walls with Mr. Clean "Magic Eraser." This product works amazingly well! Paint is the cheapest way to quickly update and freshen the look of a home. Select neutral paint colors, because they appeal to most people. For help in choosing paint colors for home staging, see color theory and interior colors for home staging. Update the kitchen and bathroom cabinet hardware. Go to declutter your kitchen for tips on painting kitchen cabinets and filling the old hardware holes and replacing with new ones. Look under ALL sinks, showers, and bathtubs in your home for leaks and slow drains. Is a toilet running? Does the garbage disposal work or smell bad? See removing bad odors. Does your bathtub and toilet need recaulking? Take a look at this instructional diy home improvement video for caulking tips from HomeAdditionPlus.com. Ugly builder-grade mirrors - Get rid of these huge, cheap-looking mirrors in your bathrooms-- home buyers hate them! Go to removing a glued on mirror for help in taking one down or adding an attractive frame to update them. Flooring - Are carpets stained and worn? Do you have broken tile or damaged hardwood? Do your floors squeak? For minor squeaking, try shaking a little baby powder into the cracks. 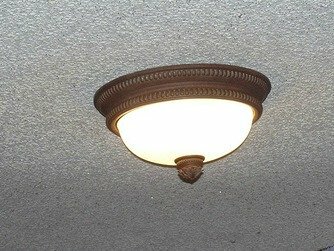 Are light fixtures in good working order? Do they need updating? Go to lighting for information on selecting the right light fixtures for each space. See the video below for diy home improvement instructions on how to do this yourself. Video by Buildipedia.com. Check all of the light switch plates and outlets in your home. They should all be the same color for good flow in your home design. If they're grimy, take them down and wash with dish soap or spray with Johnson's "Scrubbing Bubbles" bathroom cleaner for particularly stubborn grease and dirt caught in the cracks. Update a brassy or ugly chandelier by spray painting it yourself. Watch the video by stellaswan.com below for instructions on how to do this. To repair damaged tile grout in the bathroom and kitchen, take a look at the video below for diy home improvement tips on repairing these problems. Video by essortment. Painting is a great way to improve the appearance of concrete basement or garage floors. Watch the instructive video below by ppgprofessional below for directions on how to properly clean, prep and paint concrete floors. These are just some basic diy home improvement solutions that will keep home buyers from rushing out your door! For home exterior tips, go to curb appeal.